We believe that the heart of productivity is great teamwork, and the heart of great teams is great communication. Productivity today is centered on conversations—sometimes a quick instant message or call, and sometimes a meeting planned in advance including voice, video and content sharing. Office 365 is a world-class productivity servicethat helpsgreat teams to accomplish great achievements. 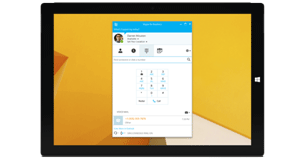 At the heart of Office 365 Communications is the Skype for Business service connecting your teams with the experience they love, in the Office applications they use every day. With Skype for Business you can simplify your infrastructure with one platform for calling, conferencing, video, and sharing. Our company offers a fully integrated communications solution based on Office 365, our services, and certified hardware to ensure the best experience for your end-users. We help our customers along all the steps of the productivity improvement journey, starting with deployment planning and roll-out, to making sure your teams are up to speed with the new solution and comfortable enough with the new ways of communication.By leveraging our company’s offering, your teams will be able to communicate like never before using Office 365 and Skype for Business.